During my late teens and early twenties I often zoomed past The Spaniards Inn, in my Beetle, on my way to Archway. Seldom would I enter, but when I did I always sat in its great beer garden and I was amused by its Dog Wash facilities, as many a dog would frequent this establishment when they had been playing on the heath. As I moved away from North London to the West, I simply did not visit any more. I did not lose love for the old place, but age makes me lazier and I just wanted a pub that was a short walk from my flat. Only recently have I made the effort to venture North to sit and relax in this 16th Century delight. Its previous incarnation was as a tollhouse and impressively it still retains its beautiful charm. Inside is most pleasing as it is so rare to see a proper old school pub in London. Original wooden fixtures, big beams, low ceilings, roaring fire and ample bar makes this pub special. I sit in the restaurant part of the venue for my dinner reservation and a wooden tray filled with assorted breads enters, distracting me from the impressive menu. I always judge a place on its quality of bread and fortunately the bread here is great. It’s a hearty affair and the fact that each dish has a recommended beer paired with it makes my husband very happy, also the fact that his pint is served in a glass mug puts a huge smile upon his face. We both agree on the Scotch egg (£5) and the char-grilled cuttlefish with peas (£7) to start. The large Scotch egg is presented on slate and has a lovely crisp outside and a hit of soft meat therein. The cuttlefish is a brilliant dish. Soft cuttlefish, salted lardons and sweet peas is an interesting assault of the senses. To keep with the hearty nature of the menu we opt for a Chicken Hot Pot (£14) and a Fish Pie (£14); traditional pub fare. My hot pot is a delight and it feels like they have taken a lot of time and effort in making this dish. Lashings of gravy and the addition of pickled onions aid this somewhat, however unfortunately the same cannot be said for the fish pie. It is potato heavy and really quite dense. The lack of sauce in the pie and the abundance of potato has dried the fish and the dish out. This is the first time this pie has been premiered, so perhaps the sauce was omitted by accident. Feeling a bit heavy and full, it seems logical to order the hazelnut brownie for dessert. Its peanut butter ice-cream accompaniment is ingenious and I might just ask for a huge bowl of that on its own next time as it is immense. 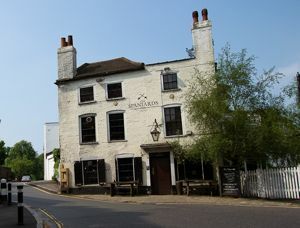 The Spaniards Inn is a local favourite. Be it revellers from the heath, muddy excitable dogs or people who have come the distance to experience this wonderful pub. If you want to see an establishment steeped in history and how pubs used to be in London before they were gastro-cised, then visit this charming venue.